After yesterday’s back of the envelope calculations relating to caloric intake vs. burn, I decided to make the effort to get a better grasp of my nutrition situation. 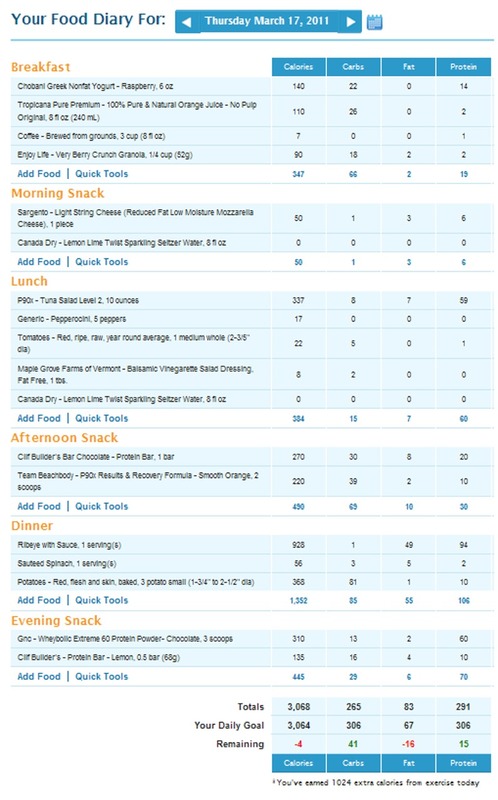 I opted to take advantage of a nice nutrition tracking tool, available free of charge by myfitnesspal.com. On this site, you can track and manage your daily intake and calories burned versus your goals. You can specify whether you goal is to gain, lose or maintain your weight, as well as the desired rate of change (eg: 1 lb/week). You can also set target Carb/Fat/Protein ratios. I’m in Phase II of P90X, so I set my ratio as follows: Carbs = 40%, Fat = 20% and Protein = 40%. From this exercise, I’ve learned several things already. Since I was playing tennis and doing P90X, I needed to add 1,024 calories to maintain weight. Doing so required that I keep adding stuff like protein bars, and whey powder. I can sense, just from entering one day’s worth of data, that my fat intake is too high. However, had I swapped out the ribeye for the same 12 oz of tenderloin, I would have reduced fat by 11 grams, putting me only 3 grams over for the day. I also learned how to convert grams to calories to calculate the ratio. For Carbs and Protein, 1 gram = 4 calories. For Fat, 1 gram = 9 calories. Following is exactly what I consumed today to achieve the Carb/Fat/Protein ratio of: 35/25/40. This is the best I could achieve given the Ribeye fat content. Core Synergistics went well. If you apply yourself, this is a tough routine. I was breathing hard and sweating. Doubles tennis practice was also fun. I drank my P90X recovery drink during this effort. This entry was posted in P90X, Round 1 and tagged Calories, Core Synergistics, Diet, Nutrition, P90X, Tennis. Bookmark the permalink.